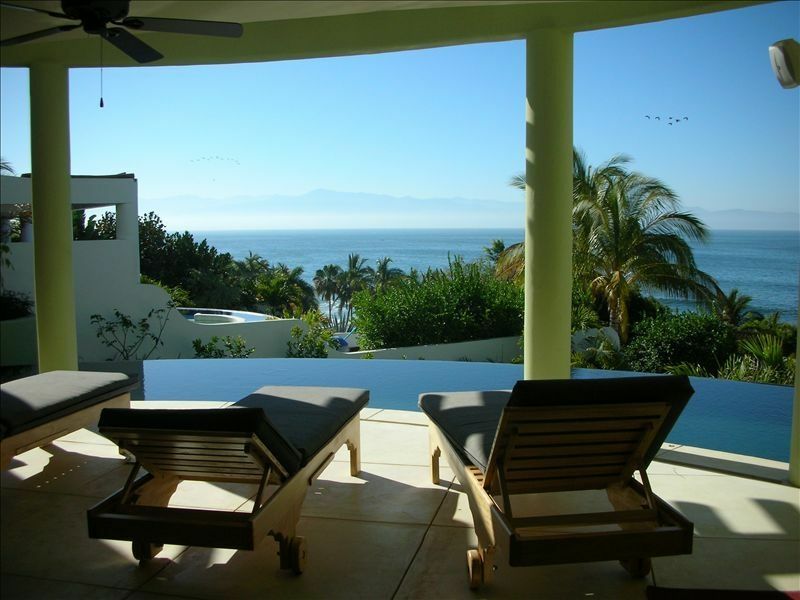 Experience the very best of Banderas Bay from this gorgeous newly constructed luxury villa. Our home is located in the peaceful, private community of Punta del Burro overlooking one of the most beautiful beaches and best surf breaks in the area. Graced with stunning views of the Bay, the sparkling city lights of downtown Puerto Vallarta and the majestic Sierra Madre Mountains as a back drop you will experience breathtaking light and color from sunrise to sunset. Our home was built and furnished using the finest woods and natural materials from the region and from throughout Mexico. We have taken great care to assure that the property is very well appointed in every way. State of the art appliances and systems include a commercial grade gourmet kitchen, 'Whole House' water filtration system, digital sound system, HDTV, wifi, and many other 'top of the line' touches for your comfort and convenience. The main living and dining area affords the truly delightful indoor/outdoor poolside lifestyle that is so characteristic of life in Mexico. There are several other fantastic places through out the villa for enjoying time alone or entertaining family and friends including the grand rooftop palapa with partial outdoor kitchen, full bathroom and ocean view hot tub. An additional palapa just off of the kitchen provides yet another great gathering space. Having travelled around the world looking for that one special spot - we found it! Perfect weather, natural beauty, and great surf breaks everywhere. There is a sense of serenity here that is indescribable. My party of 8 adults and 4 kids had an excellent time in this beautiful house. TIP have a handy copy of your booking to make getting in the guard gate easier. The view is spectacular and the grounds lush. The walk to the beach takes just a minute. The ocean is a little hard underneath and I wish I had brought a better water shoe. We had the beach to ourselves mostly and no hawkers selling anything. The pool is great but the hot tub wasn't working when we were there. The pool came with floats and their were boogie boards for the ocean. We ate most meals in because we had two chefs in our party. This was the best equipped kitchen of any rental I have every stayed in. Nice touches like the citrus juicer made our drinks better. Karen even bought us cake pans we needed for the birthday cake. There are two nice tables to sit a large group, we switched back and forth. I don't seek out houses because of their art but it is so nicely decorated it really added to the experience. She has curated a gorgeous selection and we found a new piece every day. We were all blown away. The wifi worked well, the SONOS music system was a nice touch we used everyday. Lupe the one site gardener and Pablo the manager spoke excellent english and were very helpful. The daily maid spoke less english but it wasn't an issue and she was wonderful. The house exceeded our expectations. Every moment - from when I walked in the door to when I left for the airport - was absolutely divine! The photos are only a glimpse of the beauty of the home and the surrounding area. Gorgeous sunsets, cool breezes and a day of rain that didn't bother us in the least because the outdoor palapa provided shelter. Impeccably clean, comfortable and spacious. Beautiful indoors and out - the gardens are amazing - picked my own limes! Definitely coming back. If you are undecided, do not hesitate - this home is THE place to stay in Mexico. Our family had an awesome time staying in this spectacular home and found it difficult to want to leave and go exploring! We had a group of 11 and never found ourselves at a loss for space or comfort. The house had 3 large outdoor gathering areas, each with tremendous views, and plenty of indoor space. Unbelievable kitchen with a gigantic bar for the times we decided to stay in and cook. The owner also has some fabulous taste in decorating and you really feel like your staying at a high-end resort (we even arranged for a masseusse to come to the house on several days!). Great location away from the city with easy access to all points along the north shore and a 30 second walk to surfing and fishing. The pictures only give you a glimpse of how special this place is! Located within 15 minutes of several small towns, excellent restaurants, super market - basically any need can be met within a short drive. Rates are based upon 6 people. Any increase in guest count will result in an increase in rental fee.